Not really the scene for a 'teachable moment' because isn't all of the learning supposed to be done for the next three months? Oh, but I forgot....D doesn't take a vaca, ever!! So, there Bean sat. Eyeballing her yummy cheese tortellini (a huge fav of hers), practically drooling while she's testing her BG. A lovely 94 pops up and she asks a question that gets asked A LOT each day around here "how many carbs?" I answer 76...tortellini, sauce, milk and 2 dark chocolate kisses for dessert (another huge fav). She enters the carbs, and tells me that it wants to give her 2.00units. I say OK because I totally trust the calculations of her PDM, but she hesitates. Something she rarely does. I try to explain that the PDM already calculated for her number but all I get is a relatively blank stare. I tell her to go ahead and dose and I'll show her when it's done. 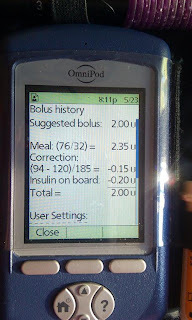 Based on Bean's settings, the PDM calculates the coverage for her meal, then subtracts for what we've put in for her target BG if she's lower than that target (adds if she's higher) and subtracts any insulin on board (IOB) from a previous correction within 3 hours (another setting for how long the insulin 'lasts' for her). So, talking her through each line...she's a visual learner like her mother..she says "oh, that's why 2.00units is right...cool." I love the fact that she's cluing into how her insulin is calculated. I hate that she has to know something that should be just done for her by her body!! It's amazing that she's starting to understand that how much insulin she gets should be effected by her BG number. It is normal to be proud and utterly sad at the same time? It was a weird mix of emotions as we chatted about I:C ratios, IOB, and target BG as she scarfed her tortellini tonight. wow! This is amazing! It's really nice that your pump lays it out so nicely too. Bitter-sweet moment for sure! Hard to watch them grow up and start learning things that most other kids there age will never have to know. YEP...NORMAL! Or we are both "freaks", which could be the case. I find that Joe is maturing and gaining "D" knowledge at a break-neck pace and it makes me puff up with pride...and it hurts a bit. Wow, summer vaca already! We still have four weeks to go until school is out for the summer. I am a tad bit jealous here. Each time Bekah hits a new milestone in self management with her diabetes, it is that proud yet sad feeling! I know it well so I'd say yes that it's normal. Great job Bean, you are one smart cookie! Enjoy your summer break from school! That's just awesome! I love how they organically lead us to teach them each step of the way. Perfect timing on this post. Not only a teachable Moment for Bean, but for me too! Thank you for taking a photo of the PDM screen. I showed my hubby the pic and explained the back-story and we were both amazed at the techy-geekiness of the machine. Very cool. And, yeah Bean for 'getting' it!!! My life is on "SCAN"
Joining the "Good Fridays" Fun! I'll Spare You the Cupcakes! "all our friends are different..."